This Irish Santa is called Pot of Gold and he is a musical decoration. Sorry, This Irish Santa figurine is now sold out. This Irish Santa is an 11" tall musical Christmas decoration that when wound up plays the Danny Boy melody. The Irish Santa features a pot of gold along with coins in his hand and a gold shamrock on his top hat. 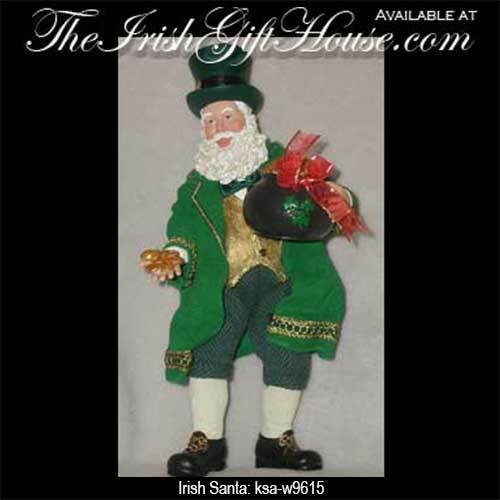 The Pot of Gold Irish Santa will make a splendid centerpiece at Christmas or may be displayed all year long. The KSA Irish Santa is made of porcelain and fabriché and he is gift boxed with a shamrock history card that is complements of The Irish Gift House.